Games Workshop have released another board game, giving me another chance to talk about my fondness for the 40K universe, and the company's style of streamlined, muscular games with strong narratives. But, you've heard me do that before, and I'm a bit worried all of my reviews are starting to sound the same; so this time, I'm going to do something a bit different. 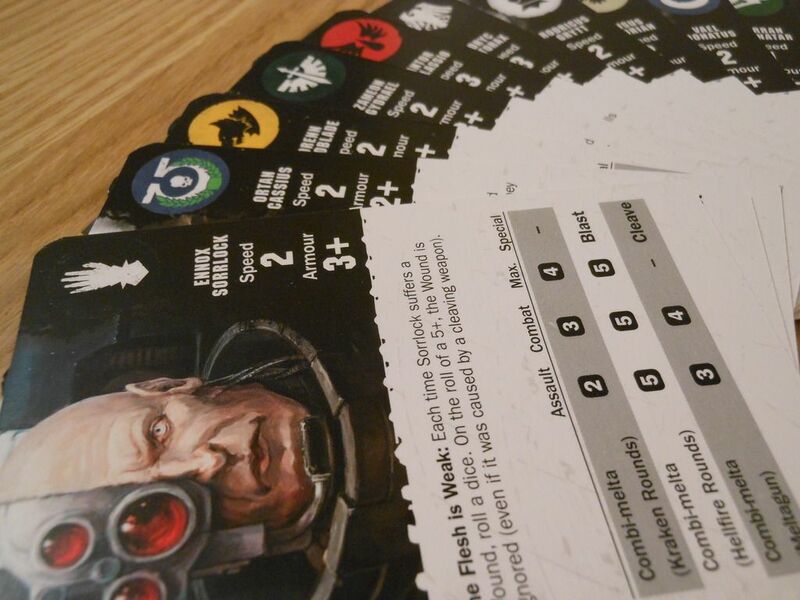 I'm going to review Deathwatch: Overkill for the people who enjoy tabletop wargames, particularly Warhammer 40,000. Hey, Games Workshop have released a box with genestealer hybrids in it! I wonder what this game is about. Are there any clues on the box? Great. 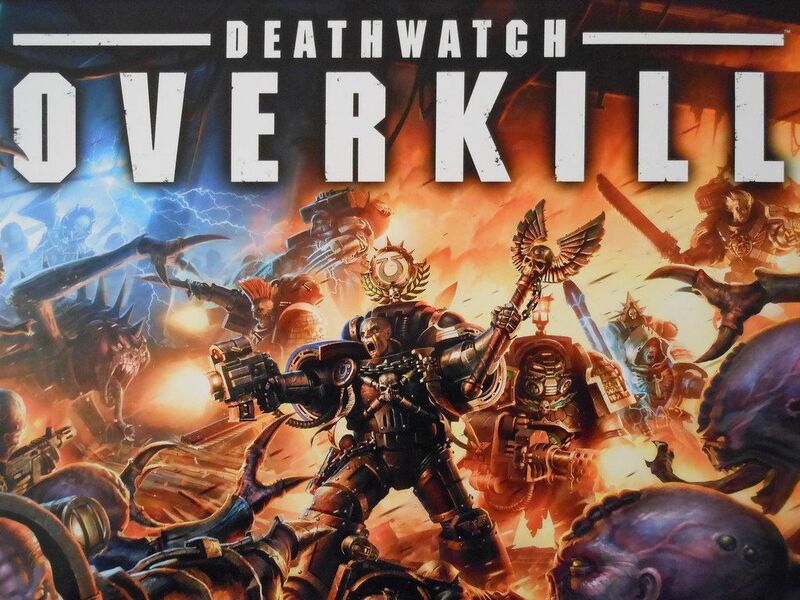 While that lot are off down the store buying six boxes to make an army, or fashioning a limousine out of an old shampoo bottle, let's take a moment to talk about Deathwatch: Overkill as a game, not just a way to get some genestealer hybrid miniatures. In fact, let's talk about how the designer is actually a bit of a genius. Yeah, I said it. Genius. I'll let that sink in for a minute while I make a small confession: I'm bored with Games Workshop. Not the universe they created. I'm bored with facing the constant negativity that overshadows every single Games Workshop release. Because I admit it; I get genuinely excited every time one of these games emerges on the horizon. They instantly go to the top of my "want" list. When there is a new Games Workshop game hitting the streets, every other game that I could possibly want to spend my money on gets sidelined. And sure, these games are not always quite what I hoped they would be (looking at Dreadfleet, there). But that's okay, and at the moment I am not disappointed with any of my Games Workshop purchases. But it is so difficult to be enthusiastic, when the Internet crawls with people who immediately mock and deride the games and anyone who might want to play them. "Why do they bother releasing these games? They should just release the models." "Exactly five people are buying this to play the game." "Buying this for the game is dumb." "There are hundreds of better things to spend £100 on." Hey, look at those miniatures! Look at the detailing on the sword. It's insane. Wow, Boy. Those are some good-looking miniatures. Some of the nicest I've seen in a long time. Possibly the best miniatures ever packaged with a board game. They take some assembling though. They are basically mono-pose, with keyed parts that fit in specific or very limited configurations, but there are just loads of bits for each model. One of the marines has a gun that comes in three parts, and even the basic grunts have four or five pieces to slot together. And they are bloody brilliant. The kits are actually little marvels, and while I was putting together the biker marine I actually stopped and sat back, just to admire the feat of engineering and design involved in making a kit that went together so seamlessly. The guy who figured that out deserves some recognition. But seriously, some of the placements on the sprue are insane. 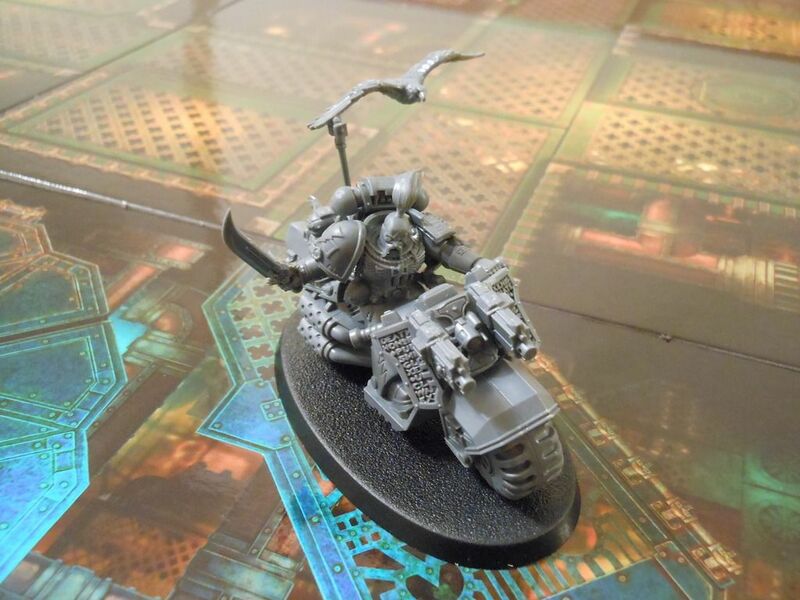 Why in the name of the four-armed emperor did someone decide to put a sprue connector attached to a genestealer Patriarch's tongue, or in the recess of someone's armpit? And why run a mould line right down the middle of a human face? These models are excellent, but cutting and cleaning them took more time than I care to admit. Totally worth it though, because I happen to think Deathwatch: Overkill is pretty damned good. Not as good as Betrayal at Calth or Assassinorum: Execution Force. Certainly not as good as Space Hulk. Good enough to stand in the line-up with the other Games Workshop products without looking embarrassed and shuffling its feet. And the designer is actually a genius. I'll let that sink in for a minute while I talk about the wonder of Games Workshop. That abberant is about to have a bad day. Games Workshop, unlike most other game companies, has crafted a world-spanning setting that has had decades to expand and evolve. It is a rich, involving universe with its own history: a history of violence, heroic deeds, and turmoil. Surely I am not the only person excited at the prospect of being able to lay out a row of Games Workshop games that accurately charts the timeline of the Imperium, highlighting the historic moments that shaped the setting I love so much. I'm not alone here. Right? And it can't be a coincidence that large sections of the fluff in the rulebook comprises vox conversations between the marines, reminiscent of the wonderfully evocative content from the original Space Crusade instructions. Whoever designed Deathwatch: Overkill is a genius. Did I mention that? 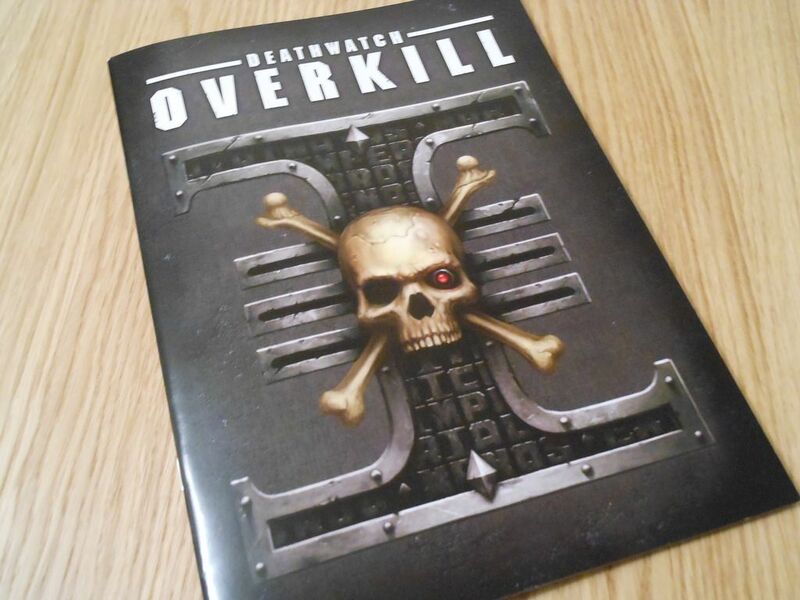 You see, Deathwatch: Overkill is a two-player skirmish-style game about the group of eponymous Deathwatch marines delving into the heart of a mining planet and discovering a genestealer hybrid cult. 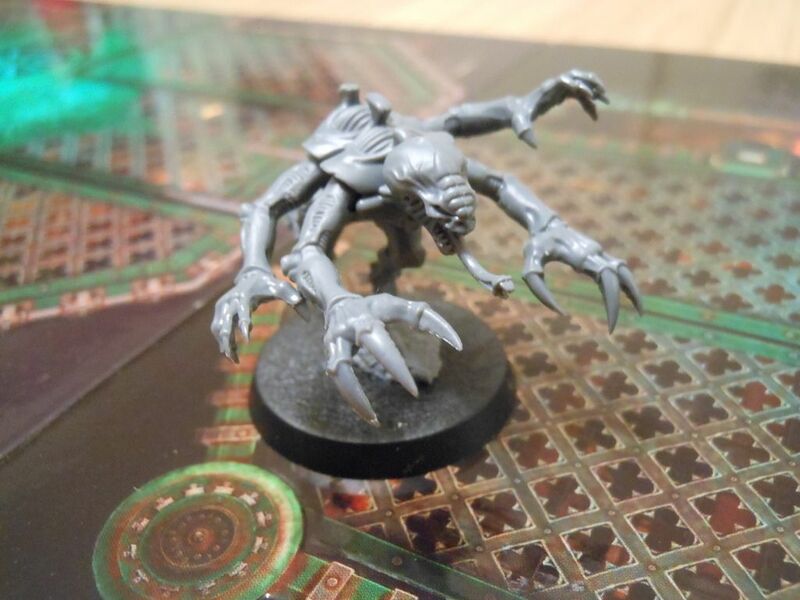 Now, genestealers are some of the nastiest things to ever happen to the 40K universe. They infiltrate society, they spread their genes, and they build a cult. Over the course of generations, they blend with their hosts, becoming hybrid creatures that are man and monster, using ancestral camouflage to protect their brood. They are a disease; a cancer that eats away at the heart of the Imperium. A threat that hides in plain sight, growing stronger, until it is time to complete its deadly scheme. It's a wonderful theme. Dark, gritty, exciting. You know, a Games Workshop theme. But that theme permeates the very mechanisms of the game itself. And that's why I say the designer is a genius. Okay. Maybe not a genius. He/she/they/it have managed to produce something that marries its theme and its mechanisms at a meta level. Because this game is a true hybrid. Not quite everything... Four marines are missing. Presumed eaten. Explosions, hordes of aliens, stoic marines unleashing hell as they roar battle cries. And that tag line: "Suffer not the alien to live." If I did political satire, I could have a field day with this stuff. That artwork - that tag line - conveys a certain message. It makes it clear you are getting a certain type of game. And you are getting that game. You are getting a dice-chucking, adrenaline-fuelled, slice of high-octane action. Because hidden away inside, among the explosions, the gung-ho action, and the bike-riding, gantry leaping, fist-pumping insanity of the firefight, is a surprisingly intricate, and insidious, spacial optimisation puzzle. Just there... Hiding in plain sight. I think he has a headache. This game melds boardgame elements - cards, movement by zone - with the trappings of a tabletop wargame, the most obvious of which is the plastic range ruler for checking if you can shoot at your intended target. A range ruler that is transparent, yet which is also the most substantial and defining aspect of the way the game plays out. 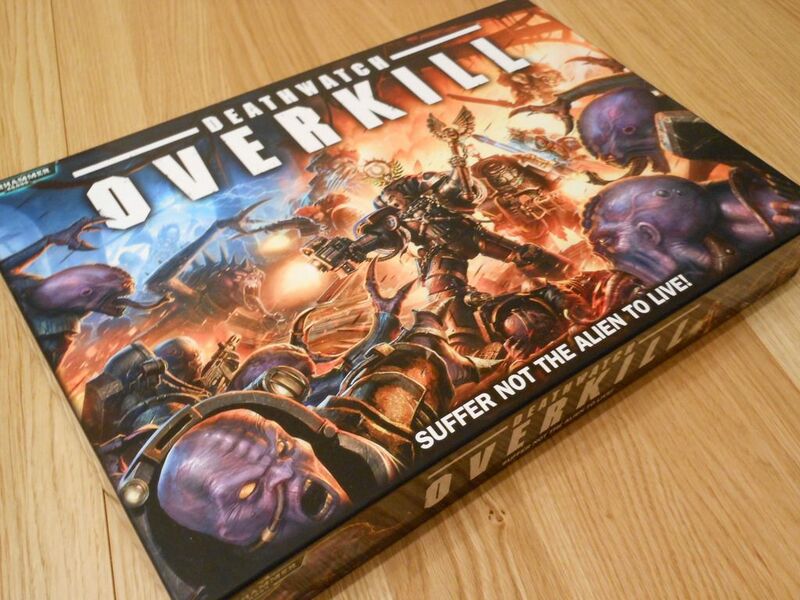 Because in Deathwatch: Overkill, Games Workshop have done something brave. They have removed the concept of cover. Rather than playing out in winding tunnels, or rubble-choked catacombs, or the ruins of a decimated city, this game plays out in an open environment of gantries and walkways suspended over yawning chasms. There are no walls, no barriers, and no safety nets. You have a full 360 degree fire arc, and if you can see something, you can shoot it... If it is within range. That's a lot of autogun fire to dodge. And this is where the game gets really interesting, and you realise there is more here than meets the eye. While there is nothing blocking your field of fire, there are plenty of things blocking your movement. For all the explosions, and dice-rolling, and lunatics on motorbikes, at its heart, this is a game about movement, and area control. As each battle takes place on suspended platforms and gantries, there are very specific limitations on where you can move. The gantries tessellate in unusual ways, and many have sections missing, forcing you to leap across gaps by moving a limited range (measured with that range ruler) and then rolling a dice to see if you take an injury. And then there is that space optimisation element I mentioned: When a model moves, it enters an adjacent zone; but only if there is space. Zones are not all uniform size, and when you move into one, you get to position your model wherever you want as long as its base is entirely within the zone boundary. That means, by cleverly placing two or three models in a zone, it is possible to deny access to that zone completely for anyone else. Furthermore, models are not allowed to leave a space where there are enemy models, as they are too busy trying to stab each other; and this rule makes it possible for the hordes of genestealers to swarm the marines, pinning them in place and denying them the ability to move into better firing positions. The marines attempt to move into the best positions possible, to create deadly crossfire patterns that leave no genestealer safe from their righteous fury, while the genestealers try to bog them down, pinning them in place, and cutting off their objectives and escape routes. This creates a fascinating situation, because it forces you to think differently about how you play the game. For example, models do not block line of sight. In fact, there is no such thing as line of sight. The game is representing a swirling firefight where nothing is in one place for more than a second, so you are free to launch attacks anywhere. This rules makes it seem like it is impossible to use weak genestealer units to shield the stronger units. Because you don't use those weak units to block line of sight. You use them to block movement. If you string a line of weak units between your leaders and the marines, optimising your position on the zones to deny access, you limit how the marines move. If they cannot advance, they cannot bring your leaders into range, and so instead they have to focus on mowing down your horde of grunts instead. And let me assure you, if you pop a purestrain genestealer in the same zone as a marine, the last thing that marine is going to be worrying about is taking a pot-shot at a character halfway across the board. He probably just wants a hug. I happen to really like this twist on the skirmish game, because it makes Deathwatch: Overkill feel completely different to anything else. And it is all achieved by putting the focus on getting models in range, rather than getting them in cover. In this game, you don't duck down. You duck back. Cover, and the modifiers it conveys, are baked into the range ruler mechanism. The further back you are, the harder you are to hit. You are hiding in plain sight. This works beautifully, once you get your head around the concept; especially once you realise that the order in which the rounds play out is vitally important. The sequence of play in each round dictates that the genestealer player first lays out ambush cards at certain points on the board (retaining some cards to use the "gambits" on them, which are sneaky tricks to give the alien scum advantages). Next, all of the space marines move, and then the genestealers move (also introducing reinforcements to the board from the previously played cards). Then, the space marines shoot, the genestealers retaliate, and the space marines (because they are badasses) shoot a second time. A space marine with a short range bolter moves into position to take down a powerful genestealer Magus. So, in the genestealer movement phases, the Magus retreats, ensuring he is just out of range of the space marine's weaponry. That space marine now has a choice. In his shooting phase, he can find a new target, or he can forego shooting in order to run. Running allows you to move to an adjacent zone, repositioning yourself to take full advantage of your next shooting phase. So, the marine moves, closing the gap to bring the Magus back into the crosshairs. But wait... Now it is the genestealer attack phase, so the genestealer player forgoes attacking with the Magus to retreat again. Now, it is the space marine's second attack phase. He is angry, determined to take down this genestealer leader, so he runs again. But, now it is the end of the round. And the space marine is completely out of position. The genestealer Magus has kited him across the board, luring him away from his colleagues and drawing him very, very close to several ambush points. The genestealer player puts down a card at each of those points to summon masses of reinforcements. And a marine dies alone in the darkness. These little tricks and traps are not evident in the rules, but they are things you learn as you become familiar with the game. After all, the rules are embarrassingly slight, taking up approximately four pages in the beautifully illustrated and deliciously weighty rulebook. It is a traditional Games Workshop ruleset, in that respect: pared down until you can see white bone gleaming through the viscera. Must be a Games Workshop game... It's got skulls on it. Because the rule set isn't where the game is. 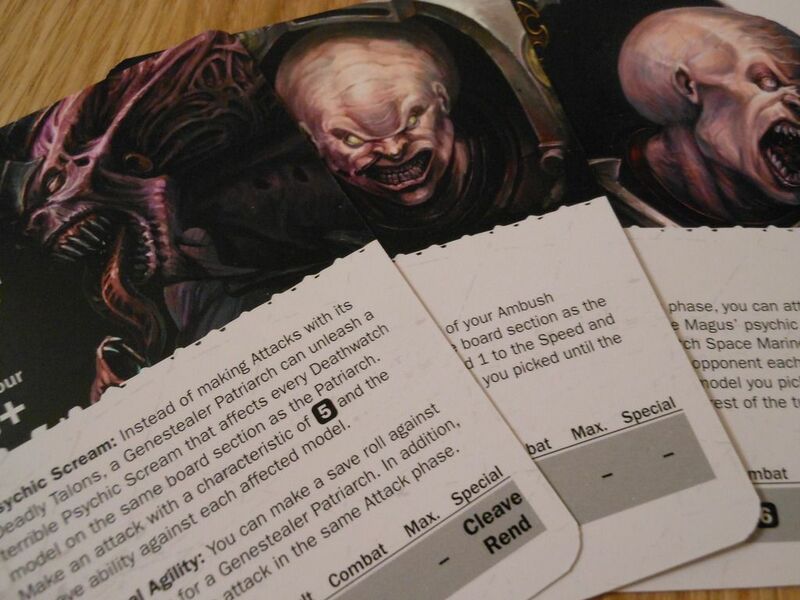 The game is in the cards the genestealer player uses to launch ambushes and surprising gambits. It is in the special abilities that each unique marine has access to. It is in the construction of the modular board, and the way in which the swaying gantries tessellate above the void. And it is in the scenarios: nine exciting, cinematic firefights that link together to tell a heroic story of man against monster, in the depths of hell. The rules actually have the clinical precision of a space marine tactical strike, and whoever put this game together has a deft understanding of how you can minimise the amount of rules while still achieving a specific style of play, and a particular narrative arc. As a simple example, consider how wounds are handled in the game. Most of the enemy models only have a single wound, but the space marines all have two wounds. The first time they take a wound, you flip their character card to the "wounded" side. If they take a second wound, they go night-night. That's all straightforward enough; but what I find interesting is that there is no statistical difference between being wounded and unwounded. The marines don't lose combat effectiveness. They don't get slower, or weaker. They are just as kickass as they were before. Because there is no cover in this game. You are utterly exposed, in the heart of enemy territory. Once a marine takes that first wound, you use them completely differently, because the thought of taking that second wound is terrifying. An unwounded marine will pile into combat, pushing forward bravely, leaping across gantries like a gazelle. Things change once the wounds start to pile up. You advance more cautiously, you try to stay out of range of the most deadly enemies. Any genestealers with the "cleave" ability (which negates armour saves) become the most terrifying combatants you have ever faced. And do you really want to risk the life of your marine by jumping between the gantries? There's a one in six chance of taking an unblockable wound, after all. Maybe you haven't got a choice, in which case you roll your dice and take your chance. It will be one of the tensest dice rolls in your gaming life. And that's how this game works. It doesn't put in extra rules to define a game state. It takes those rules out, and lets the psychology of the players define the game state. However, a wounded marine is far from beaten, as they all have access to the "combat recovery" action, which allows them to restore one wound if they do not shoot or run in one of their attack phases. But every time you use that skill, you are letting genestealers fill the board. You are suffering the alien to live. And when do you choose to heal? Choose to heal in your first attack phase, and you are giving every genestealer you would have killed an opportunity to attack you before you can retaliate. Choose to heal in your second attack phase, and... well... maybe you won't live to see that second attack phase. Deathwatch: Overkill is full of these little nuances, these little moments. They are the decisions you won't see in the rules. The drama that exists between the lines. They are the gameplay, hiding in plain sight, gradually emerging the more time you spend in this dark and foreboding lair. The more you look - the more you key into the style of play - the more you find. Everything about the game has this sense of being a hybrid, of combining styles of play. Of seeming like one thing, but actually being something else. At first, the game feels like a simple dice-chucker. True, over the course of a game you are going to chuck a lot of dice. But take a look at how many dice you roll in a single attack... frequently, it's only one. And it's never more than three. Rolling a single dice does something on a psychological level. When you roll a bucket of dice, and then sift through the results, you generally get some good stuff and some bad stuff. You usually get a few hits. Even a bad roll tends to be a partial success, and you can take something away from the interaction to use to your advantage. But it's different with single dice rolls. It's a hit or a miss. Pass or fail. Success or failure. Every miss feels significant. Every hit is a victory. And even a 2+ armour save suddenly feels inadequate. But, at the end of the day, games like this live and die by their scenarios. And Deathwatch: Overkill has some doozies. 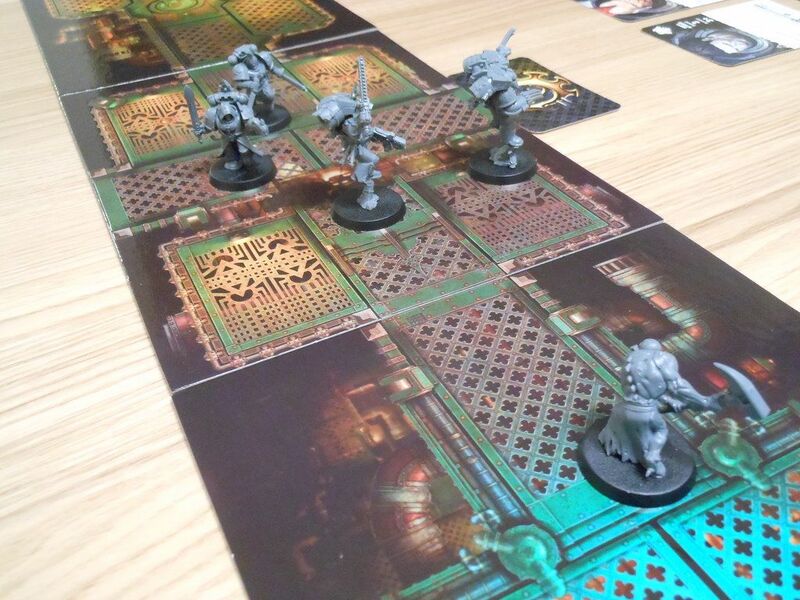 There is a mission that involves a small group of marines steadfastly guarding an elevator while one of their colleagues races through genestealer-infested corridors to reach them. There is a mission that winks at Star Wars: A New Hope, and involves leaping a chasm to plant bombs on a silo. There is even a mission where the marines are desperately trying to stay ahead of an explosion that is causing the gantries to collapse into the yawning void of the pit. Mission 4 gets pretty tense. Most of the scenarios are fantastic, but there are a few that do not fit comfortably within the style of play the game generates. With no cover, and so many area of effect weapons, body counts tends to be high, so any scenario that involves the marines killing a certain number of genestealers feels lopsided and awkward. This game thrives when an endless host of genestealers hunts down marines as they race to their objectives, and it stalls whenever the marines are allowed to form a strong defensive line and shoot the crap out of anything that moves within range. Fortunately, there are only two missions that really degenerate into wars of attrition, and which suffer for the constraints the board designs impose. The rest of them are bloody brilliant. But the game is far from perfect. There are lots of little things that are not quite right. Nothing terrible, but in a way, that makes it worse. Because every problem I have with the game is easy to resolve with just a bit more care. For a start, there have been some complaints about quality control. My copy was perfect, but some people got miscut cards. 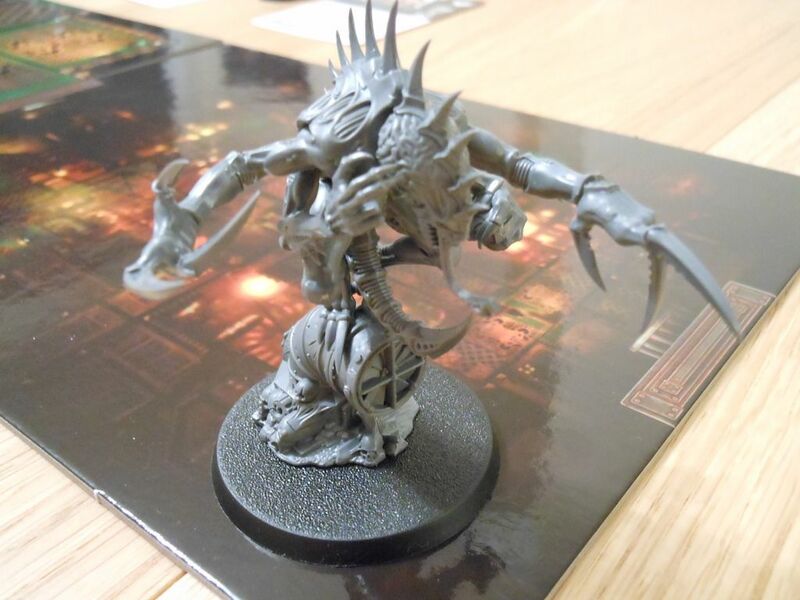 Some people also received the wrong number of bases, which probably stems from an error in the assembly instructions, which specifies the Magus and Primus genestealers should be on 25mm bases, when they should actually go on 32mm bases. There are also signs of an eleventh hour change in the rules that did not make it into the wording on some of the cards. The Magus and Primus both have special abilities that are supposed to happen in the "Ambush Phase." However, that phase is actually called the "Broodmind Phase." There are also a few "glitches," where it seems like the designer forgot the rules. The most obvious of these is in the use of the homer beacon. Basically, the terminator marine is very slow, so to compensate, one of the other marines gets to carry around a homer beacon. When the need arises, the terminator is allowed to teleport to the beacon, getting back into the thick of the action. When I read about that in the preview materials, I was really excited. I had visions of being able to leap around the board, of throwing the homer into the midst of a genstealer horde and ripping it open from the inside, of leaving the homer in an empty space to use as a trap later in the game, or even dropping it by an escape route to facilitate a rapid extraction following the completion of a mission objective. Unfortunately, this is one of those instances where the mechanisms do not match up to the theme. The homer is actually a single use item, and the marine carrying it around is never allowed to drop it, or throw it, or pass it to another marine. Effectively, once per game, the terminator is allowed to make a free move to that marine's space. It's just not as exciting as it could... should... be. But worse, the implementation of the rule is fudgey. At the start of the game, you give the homer to one of the marines, and he carries it for the rest of the game. But the rules specifically state you can put the homer token on the marine's character card, or on the board beside the marine's model. That's fine, except this game is all about movement, and space optimisation. The homer beacon is a physical model on a 25mm base. It takes up real space on the board. So, you can effectively use it to block enemies from entering a zone, and can similarly screw yourself by moving into a small space with it, and then finding out there isn't enough room to teleport the terminator in with you. Clearly, the homer should always be on the character card; doing anything else just creates confusion. But then, this is Games Workshop, and they are not exactly known for writing good, clear rules. They have a tendency to word things in a slightly vague and fluffy way that is open to all kinds of crazy interpretations. "Exceptional agility: You can make a save roll against Cleave attacks for a Purestrain Genestealer." "Exceptional agility: Purestrain Genestealers can make a save roll against Cleave attacks." "No more than one card can be laid at an Ambush Point at the same time." "There can be a maximum of one card at each Ambush Point at any time." "If a model is hit by an attack, there is a chance that its armour will deflect the blow and prevent any damage. To see if this is the case, roll a dice; if the roll is equal to or higher than the Armour characteristic on the model's datacard or datasheet, the hit has no effect. If the armour save is failed, or a model has an Armour characteristic of "-", the model suffers a wound." "If a model is hit by an attack, there is a chance that its armour will deflect the blow and prevent any damage. To see if this is the case, roll a dice for each successful hit; for each roll that is equal to or higher than the Armour characteristic on the model's datacard or datasheet, one hit is negated and has no effect. For each hit that is not negated, because the armour save is failed or because the model has an Armour characteristic of "-", the model suffers a wound." And don't even get me started on how the rules make it sound like you can use the jump action to escape from hand-to-hand combat. 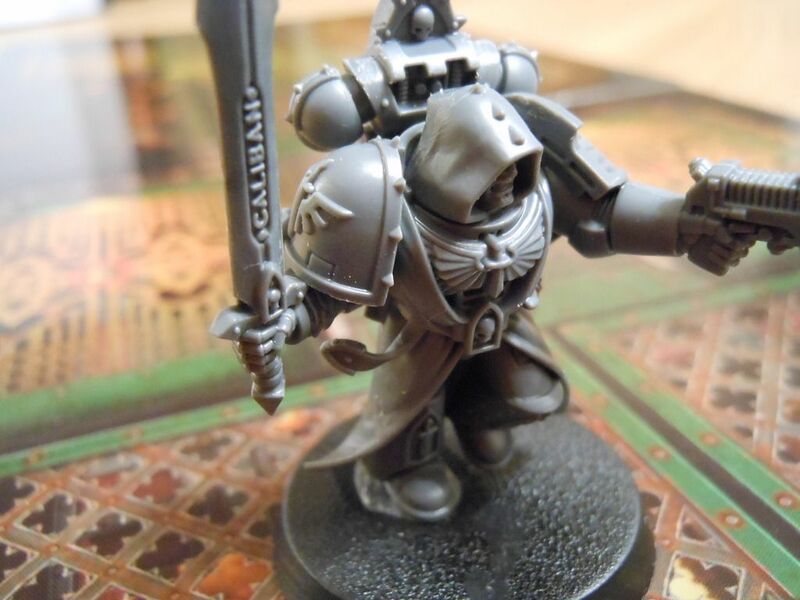 Another issue with Games Workshop is the tendency to favour form over function. This is evident in the design of the marine character cards. Each card has a really good piece of artwork depicting the character, but those pictures do not always relate to the miniatures. Some of the pictures depict marines with no helmets on, yet the miniatures for those marines are wearing helmets, which just makes it more difficult to teach new players, and more difficult to keep track of what is happening in the heat of battle. The broodmind cards are also problematic. These cards serve a dual purpose in the game, and each card has two distinct sections. The top section lists some reinforcements, and if the genesteale player lays the card face down by an ambush point on the board, those reinforcements enter play. 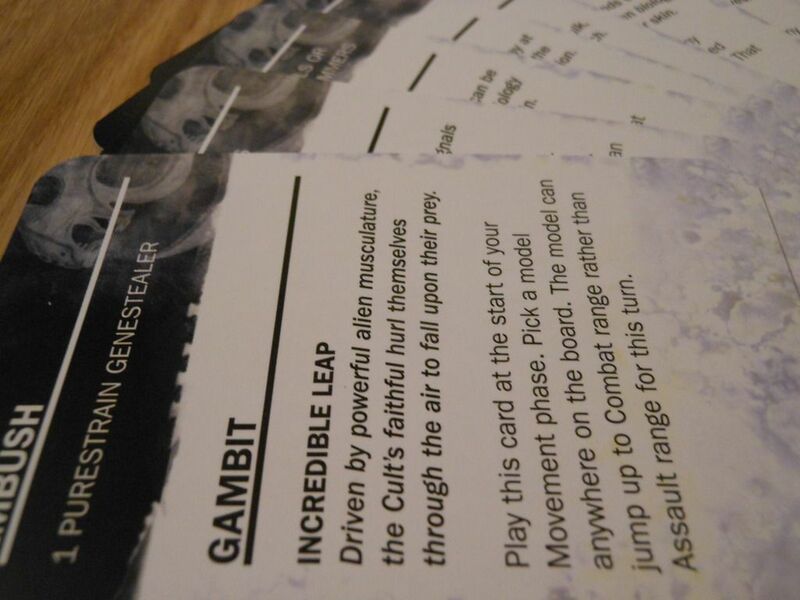 However, the bottom section of each card is a special gambit. 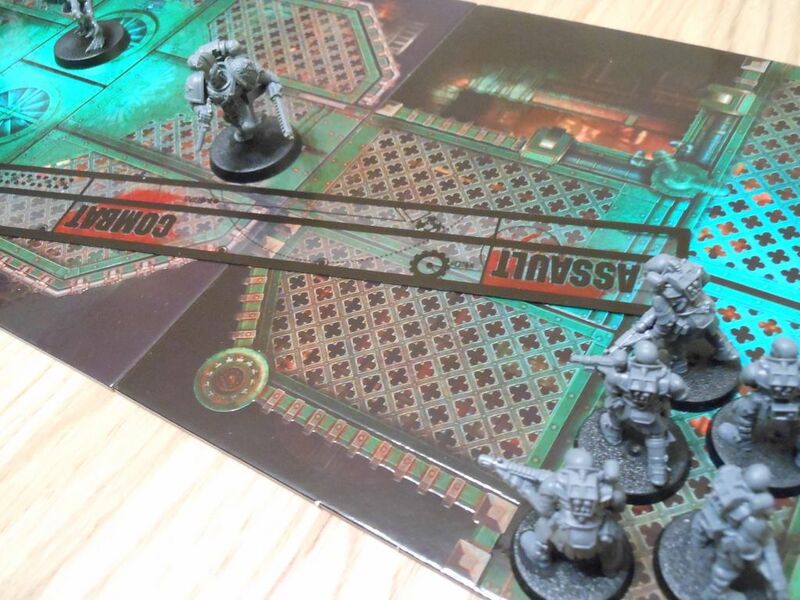 If the genestealer player chooses to keep hold of the card, it is possible to use the gambits later in the round (or in subsequent rounds) to play horrible tricks on the marines. Naturally, some of the best gambits are on cards that bring the most powerful genestealers into play, which creates some interesting choices. However, the layout of the cards is not conducive to play. They are packed with text, so when you draw a new hand of five cards, it takes a few minutes to parse the information to decide which ones to keep and which ones to use as ambushes. Furthermore, there is no formatting to assist easy recognition of when and where to play the cards. so you will find you have to constantly scan through the blocks of text in each phase of the game, to check you aren't missing out on a cool special ability. I also feel that, in places, they have gone too far with the streamlining of the rules. For example, every gun wielded by marines and genestealers alike is defined by up to three ranges, a number of dice rolled at each of those ranges, and three special abilties: Cleave (no armour save), rend (carry hits to other enemy models in the zone), and blast (attack every model in a zone). To a certain extent I applaud this approach. It keeps things smooth and slick. It minimizes weapon lookup on your turn. It keeps the game easy to learn and fast-moving. But shooting a flamer doesn't really feel any different to shooting a grenade launcher. Attacking with a chainsword doesn't feel any different to attacking with lightning claws. And, of course, it wouldn't be a review of a Games Workshop title if we didn't spare a moment to talk about price. This time around the RRP is £100. Right there, Games Workshop have made a mistake. They set the price at three digits. And three digits is significant. Three digits is a milestone. It's basic consumer psychology, really. The difference between £99 and £100 isn't £1; it's a whole extra column of numbers in the account ledger. But here's the thing: that price isn't that unreasonable. Do I wish it was lower? But for £100, you are getting 51 of the finest miniatures on the market (around 36 unique sculpts, including 11 "hero class" marines, a Magus, a Primus, and a whopping great Patriarch). At RRP you are paying less than £2 per miniature, and that doesn't take into account the boards, cards, the lavishly illustrated rulebook, or... you know... the actual game. And I didn't even pay £100. I preordered the game for £80, got free postage, and some money back in store credit in a loyalty scheme. Just for the record, I could order Zombicide Black Plague right now, and it would cost £71 plus postage. I could order Ghostbusters for £53. Or I could order Iron Kingdoms: The Undercity for £60. Suddenly my £80 seems pretty reasonable. And besides, none of those other games have a lunatic with a cyber hawk on a motorbike. A bike... in a mine... riding on gantries... THIS MAKES NO SENSE! Now, that sounds like a lot of complaints. Maybe it is. But it's all pretty minor in the grand scheme of things, and I cannot stress how much fun the game is. That fun dramatically outweighs some funky wording in the rules, or some bad formatting on the cards. Really, there is so much more I could say; but I fear I would write forever. I could tell you about the incredible replayability; about how there are 11 marines, and at the start of each mission you get to select which ones you use, so you can create cool synergies, and make old scenarios feel fresh and new. 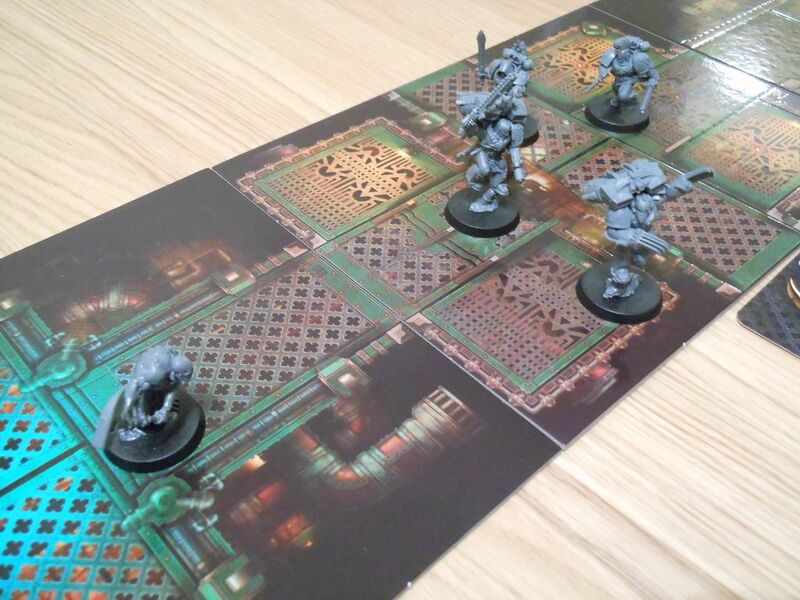 I could tell you about how the boards have embossed zones, making it quick and easy to position your models. I could tell you about how the clever use of a broodmind card at the perfect moment can transform a crushing defeat into a glorious victory for the four-armed emperor. And I could tell you stories. Stories about my blood angel hacking his way through purestrain genestealers, only to get tapped from a long-range shot by a cultist with an autogun. Stories about my salamander locked in a whirling combat with an abberant as the gantries exploded and dropped them both into the abyss. Stories about a crazy guy on a motorbike... Yes, I keep mentioning it and I'm serious. One of the marines is actually riding a motorbike, a rather amusing throwback to the kind of "crazy" Games Workshop used to dish up when I was a lad. I could tell you those stories; but you will have more fun finding them out for yourself. Instead, I will just tell you this: I like Deathwatch: Overkill. Is it my favourite game ever? But it is a lot of fun, and it repays my faith in Games Workshop. I am glad I bought it. And the next time Games Workshop releases a game, I'l buy it. Because I want the company to know that - yes - this is the right way to go. Making these games is making people happy. Some people want these products. And part of the reason is because I fear it can't last. I want it to, but it can't. I fear that, sooner or later, Games Workshop are going to listen to the constant negativity, and they are going to stop trying. After all, it seems like the people who hate Games Workshop write the games off before they even come out. The people who enjoy Games Workshop's core products mock the games. The people who enjoy boardgaming are turned off by the hobby aspect and the price. It leaves me... and maybe you... standing above the bottomless dark of the abyss. Stranded. Isolated. Alone. Who's trip-trapping over my bridge? Or then again, maybe I'm wrong. After all, there are already murmurs of a new release of The Lost Patrol. Maybe this is all part of the plan. An Assassinorum here; a Betrayal at Calth there... Little, unassuming games. Exceptionally good games. Steadily growing. Expanding to create a network of interlinked titles. Weaving themselves into a tapestry that spans the stars and the centuries. Waiting to come out into the light and rule the gaming world. And I, for one, would like to be the first to welcome our new four-armed overlords. I'll even make them a limousine out of a shampoo bottle. Well, thanks for that article. I totally support what you've wrote, and feel that it is a good game, fun and appealing. And I feel sorry to hear all the constant mokeries about it. > So who does that leave? Count me in that group ^^. Thanks for reading. I'm glad I'm not alone. I just wish my French was better! I must admit, I did buy it for the genestealer miniatures, as I lost my cult army years ago and now I can bring it back! That said, the game does look like fun and I am keen to give it a try, and I am quite excited by this new wave of non-wargames. I know a lot of people complain about GW's lack of advance marketing but I quite like the way that these games are appearing out of nowhere, and the first hints of their existence leak two or three weeks before they are available to buy. It's exciting! I agree. However, it looks like GW are going to change that approach. They have announced The Lost Patrol, due for release in June, teased a Sigmar game for the summer, and a sequel/standalone product for Betrayal at Calth for the end of the year. There are even pictures floating around of a flyer advertising Blood Bowl for 2017. 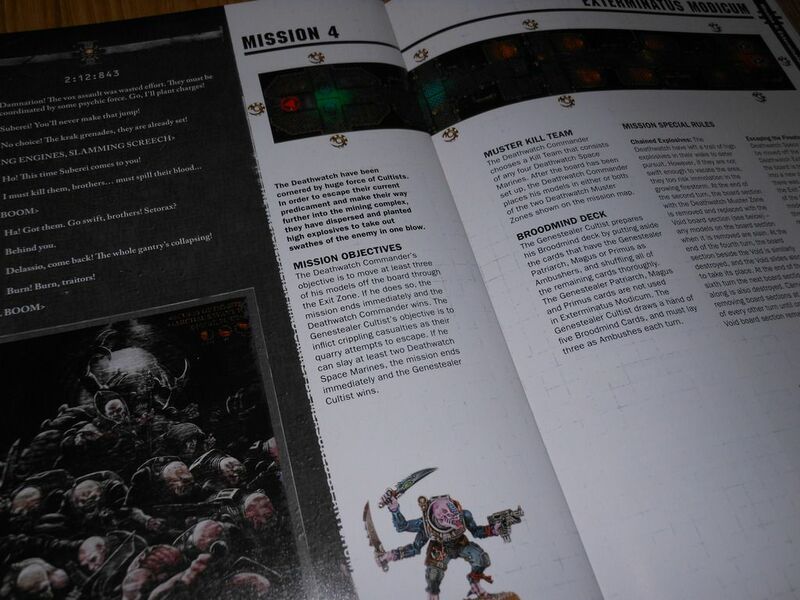 The Blood Bowl box has been spotted in the wild too; you can see it in some of the Lost Patrol pictures. Exciting times! Me too. I'm quite happy with GW's current direction. There seems to be lots of new ideas, or at least new-old ideas. Great review. 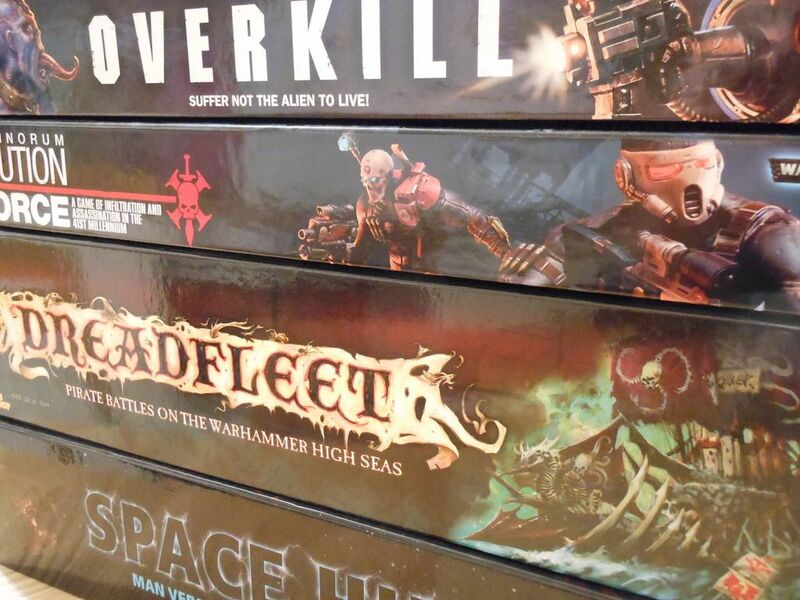 I too am annoyed by the constant sniping on 40K boards regarding anyone who is interested in buying these games for, well you know...the game. I have plenty of pretty 40K models and armies, but I am sucker for GW games that hark back to the golden days. Out of interest what do you think of Dreadfleet? Did you review it? I played through the entire campaign and found it thoroughly enjoyable, well themed if perhaps a little too random in game play. That alone seems to make me a pariah. I haven't reviewed Dreadfleet yet. I preordered it, so I have had it for years, and I keep meaning to get the review done, but somehow never get around to it. I am hoping to get it written in the next few months though. You can sub to this blog, or keep an eye on BoardGameGeek, as I double-post there, if you want to check it out. I actually really enjoy Dreadfleet, but my expectations were incredibly high after Space Hulk, and it wasn't as great as I wanted it to be. I think I was expecting the next Battlefleet Gothic or Man O'War, and against those standards it falls short, which is why I say it wasn't quite what I hoped for. However, as a big, silly game with a lot of randomness, I think it's good fun. And it looks stunning, obviously. Feels slightly odd to be commenting on a post from eight months ago, but I've just found your blog and it's excellent! I'm so glad I'm not the only person who is loving the new GW. 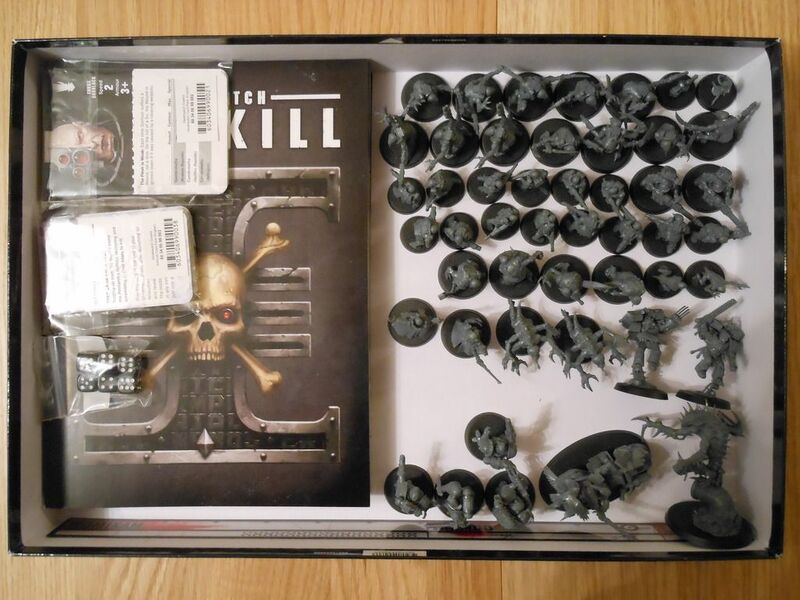 True, I primarily bought this box for the Deathwatch marines, which are absolutely gorgeous and I'm having a tremendous time painting up, but I'm also truly interested in the boardgame itself. I've been trying to keep up with these new releases, and they all look really great, but I haven't yet had a chance to try any. I think I might give Execution Force a try soon, using some proxy miniatures because I still haven't assembled those guys yet. But anyway, thanks for the wonderful posts - keep them coming! Thanks for taking the time to read and comment. I'm glad you are enjoying the blog. Deathwatch Overkill is a lot of fun, and it's really nice to have a squad of marines where each one has a personality. The latest edition of Space Hulk did that to a certain extent, but this is the first time where everybody has a fleshed-out character. Assassinorum is a very clever little game, and is a really excellent solo game if you can't get together a games group for the evening. As for me... I should be reviewing Burning of Prospero this week, and my copy of Blood Bowl turns up at the end of the month too, so I've got plenty to keep me busy.